I haven’t posted anything in a couple of days because I have been busy trying to get caught up with work and because our oven when on the fritz the other day and refused to ignite. I was able to cook on the stovetop but we were pretty limited in what we could have, but thankfully my brother helped me out and I got the part to fix the oven and he was able to get it going again today, so I can get back to cooking meals and treats again tonight. In the meantime, I can let you know about a recipe I tried a week ago when I had some bananas that were passing their prime and needed something to do with them – fast. I knew I could make some banana bread or some banana muffins, but how about combining the two and topping them off with a nice glaze? That sounded even better and I came across this recipe at Cooking with Ruthie for baked banana bread donuts with a browned butter glaze that I chose to make as muffins instead. I am sure they make great donuts too if you have the right donut pan, but muffins were the easier way to go for me this round so that’s what I did. In a large bowl, blend the butter, applesauce, sugar, eggs and egg whites with a hand mixer. Slowly add in the all-purpose flour, lemon juice and baking soda and mix on high for about 2 minutes to mix the ingredients well. The batter will appear glossy when it is done. Mash the bananas in a separate bowl and gently fold in the bananas to the batter until they are well incorporated. Preheat the oven to 350 degrees. Using a muffin pan lined with muffin papers, fill each paper with batter until it is about 2/3 full. The batter should make 18 to 24 muffins. Bake the muffins in the oven for about 18 to 20 minutes or until a toothpick or cake tester inserted into the center of a muffin comes out clean. Cool the muffins in the pans on a wire rack for about minutes, then turn them out onto the wire rack to finish cooling. For the glaze, melt the butter in a medium saucepan set over medium-high heat, watching the butter carefully to see when it reaches a medium brown color and has a nutty aroma. Remove the pan from the heat. Whisk in 1 cup of the confectioner’s sugar at a time, adding 1 tablespoon of milk as the mixture thickens to help thin it out. Adjust the milk as necessary so that it stays thick enough to stay on top of the muffins. Add the vanilla to the mixture and whisk until the glaze is smooth. 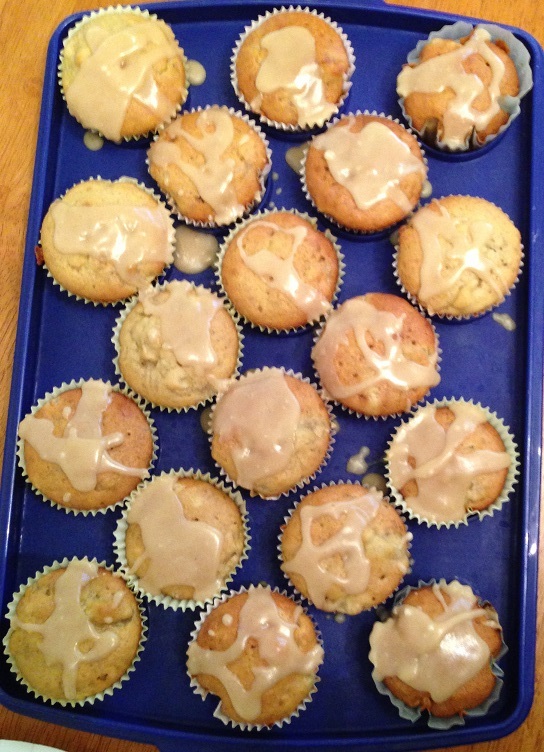 Drizzle the warm glaze over the tops of the muffins. The glaze will set quickly so you want to work quickly while it is warm and pourable. Cool the muffins again and serve. The muffins had that great banana bread texture and flavor so they came out perfectly, and the glaze added a touch of sweetness to the muffins that plain banana muffins did not have in the past. I think you could get even better flavor out of the glaze and jazz it up a bit if you added a bit of banana liqueur or some dark rum to give it a bananas foster type of flavor. Maybe next time around I will give it a try. I think these would be great donuts too, but I only have the mini donut pan and it would have taken several batches to make them, so I opted for muffins instead. This is a nice alternative to banana bread if you need something to do with extra bananas.